Google's maps are not the only ones of interest: for those interested in science there are many more maps out there that show things like population density, cloud images, etc. Some of these maps are available via Web Map Service WMS interfaces as specified by the OGC. WMS is essentially a standardised interface to maps on the Web that allows a client to specify the format (e.g. PNG), the size (e.g. 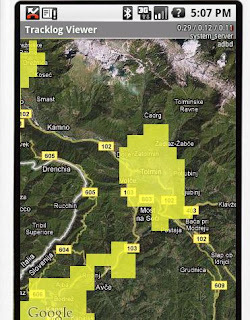 320x460) and the exact geographical coordinates: and what the user gets in return in an image. That makes it very easy to overlay Google Maps with all sorts of imagery, particularly satellite imagery. It is very simple: it somehow gets a Bitmap image from a class WMSLoader, to which I come in a second. Then it simply draws that image on the canvas, making it here semitransparent, so we see the underlying Google image. To get the WMS image we first need to get the corner coordinates of the screen, which is not very difficult as the projection object has a translation function for this (0,0) is the left top corner, and the right bottom is (width(), height()). This class here has most of the URL hard-coded for proof of concept. Here we get an image from the ICEDS server, an academic WMS Server at University College London. In this case the 'lights' layer, which shows night-time light pollution - an indication of populatio density (or industrial activity). We just compose the complete URL, then open the input stream, where we get the image and pass it back to our Overlay. Bingo. i'm wondering what is the maputils class ? The MapUtils class was just a simple class that extracts a few data values, eg. latitude or longitude from tuples or computes the corner coordinates of a map image. I am away from my desk at the moment, so I cannot give you the code, but it was nothing magic. Hey, awesome work! Can you share your MapUtils class? Thanks much for the tutorial, It would be really helpful if you could post the maputils class. that works well, but is there an update? because performance is very bad when panning or zooming. Feel free, but this code is so old, I am pretty sure there is something better out there.